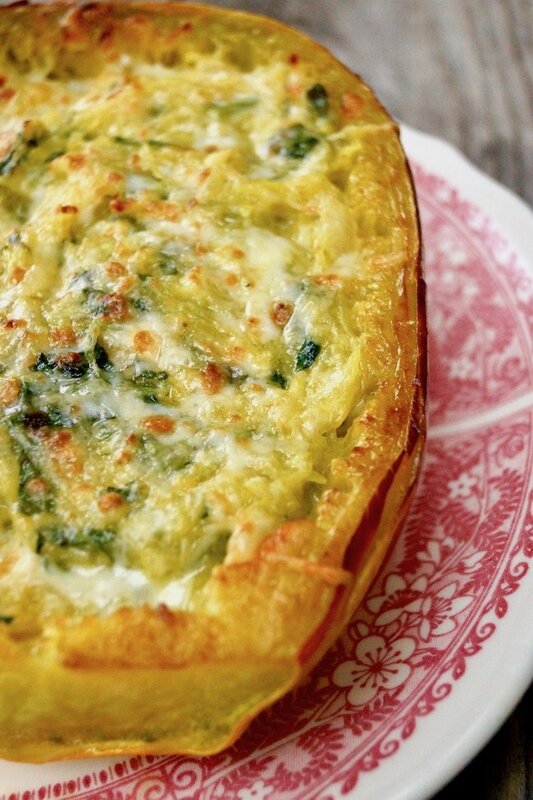 It’s true: My kids love this Cheesy Spaghetti Squash recipe. When I served this amazing dish the other night, they devoured it. Not a speck left on the plate AND requests for seconds! Seriously, they asked for seconds and there was no ulterior motive! 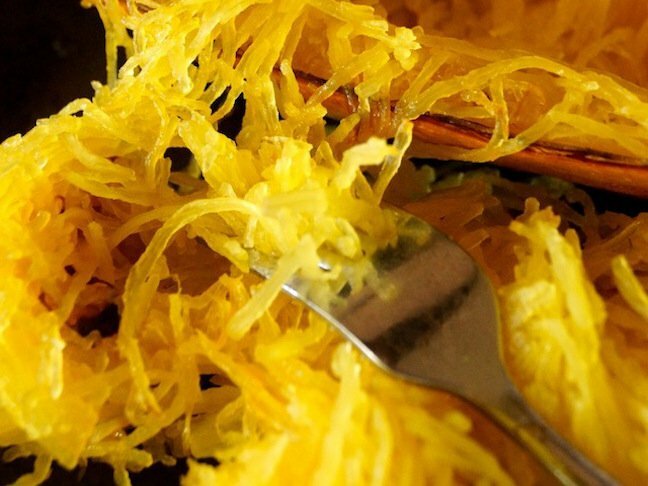 Not only is spaghetti squash delicious, but it’s fun — after all, the squash is in fact reminiscent of spaghetti — pasta! Everyone at the table enjoyed this hearty, comforting, vegetarian plate. And I love that it is easy to make and can be served as a side dish or a main course! 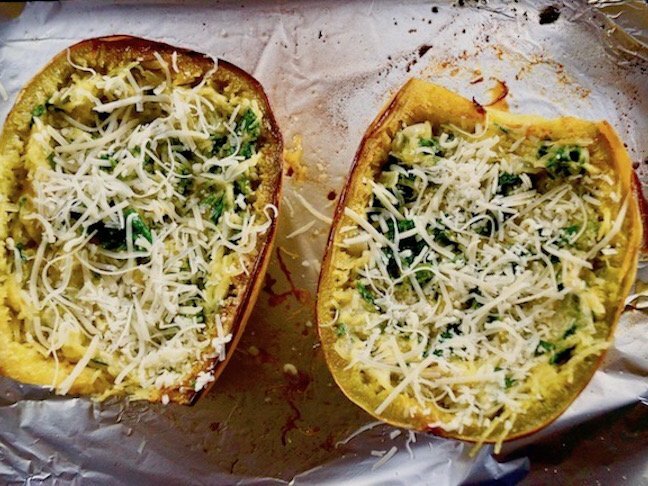 Want to make this Cheesy Spaghetti Squash recipe for your family? Follow the easy recipe below! When I served this amazing dish the other night, my kids devoured it. Here's to hoping yours will, too. Step 1: Preheat the oven to 400 degrees F and adjust a rack to the center. Step 2: Cut about an inch off of the stem end of the squash. Place the squash on the flat base you’ve just made and use a large chef’s knife to slice it down the center, vertically. 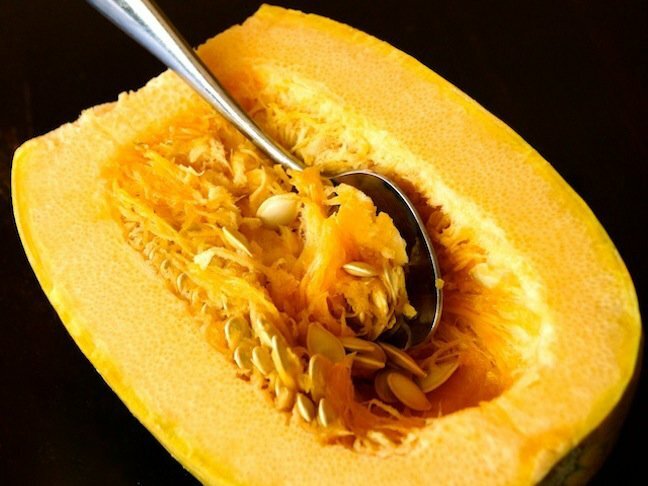 Use a metal spoon to gently scrape out the seeds from both halves. Do not worry about the stringy insides left from the seeds. Step 3: Drizzle a bit of olive oil on a baking sheet and place both halves of the squash, round side up on the sheet. Roast in the preheated 400 degree F oven until they’re soft, about 40 minutes. Step 5: Use kitchen tongs to carefully turn the squash over to let it cool for a few minutes. Then use a fork to very gently pull the flesh away from the skin. It will naturally come off in strings. Turn the oven down to90 degrees C.
Step 6: Add the squash to a large mixing bowl and let it cool for at least 10 minutes. 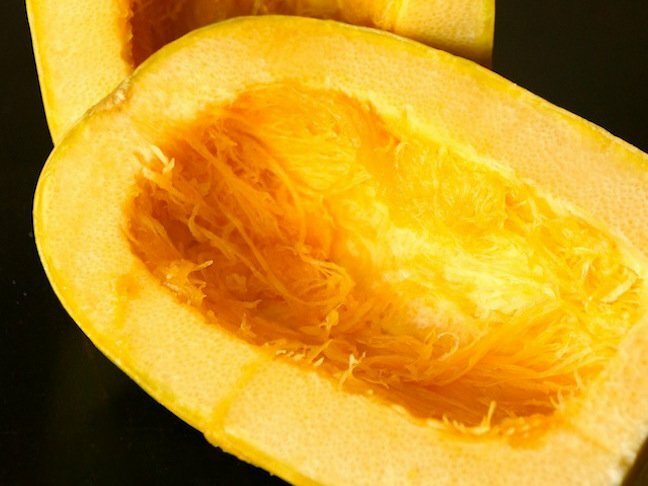 Use a spoon to get any extra strings from the inside of each squash half, and to smooth their surfaces. Add the spinach mixture and all but ¼ cup of each cheese, and stir to blend everything together. Step 7: Divide the mixture among the two squash “bowls”, and top each one with a mixture of the remaining, combined ½ cup of cheese. Step 8: Place in the 375 degree F oven for about 10 minutes. The cheese on top should be melted and slightly golden. Let them cool for a few minutes and serve.